Incinerated – o frabjous day! 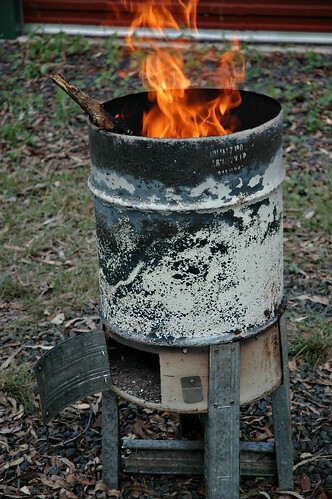 While I hung out washing this morning and raked leaves on Sunday morning, the husband built this incinerator from an old drum we got from a friend’s property, and some other scrap metal he picked up somewhere. Our house is surrounded by tall eucalypts that spend all year dropping leaves, twigs and sometimes quite large branches, and the preponderance of this dry material means that large bonfires aren’t a sensible idea. Hence the need for an incinerator. We burnt a pile of leaves and declared the incinerator a success. I hope that all the washing won’t smell like smoke as a result – I like the smell of fresh wood smoke, but not stale on clothes. The chooks are much less wary around me when I walk out to Chickendome to deliver potato peelings, wilted lettuce and apple cores – they move away from me when I open the door, but cautiously trot up when I scatter the vegetable scraps on the ground. They haven’t been let out yet – I think I’m going to wait another week, until they’re more comfortable with me and I can be a bit more confident that they’ll make their way back to Chickendome at dusk. My mother has advised me to hand feed them some sesame seeds, which are apparently the equivalent of chocolate cake to chicken-kind and will inspire their eternal love and devotion. And perhaps some eggs. Sunflower seeds not Sesame – although they may eat the latter I’m not sure how excited they would be about it! Hahaha – I was thinking as I typed that, “Hmm, do sesame seeds have husks?” I couldn’t really picture it. I’m glad you commented otherwise I would have been happily sprinkling sesame seeds for the chooks and wondering why they weren’t thrilled about it. I would have entirely lost their respect!